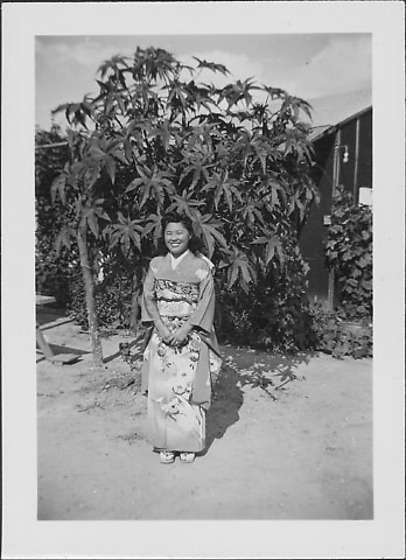 Full length portrait of a smilng young woman in floral kimono with furisode sleeves in front of a tree and barracks at Rohwer concentration camp, Rohwer, Arkansas, 1942-1945. Her hands are clasped in front of her. Tree with large seven pointed leaves at L, climbing vines in front of barracks in background, R. Same woman in 97.292.8F and 97.292.6BY.